The largest city in Colorado and the state capital is Denver, the Mile High City. Situated at 5,280 feet above sea level, Denver rests at the foot of the impressive Front Range of the Rocky Mountains, and at the crest of a gradual rise in elevation from east to west across the Great Plains. A hub of commercial activity for not only Colorado but all surrounding states, Denver is a transportation center, with three major highways, a major airport, and a variety of railroads serving the city. Denver is also the gateway to the ski resorts in the mountains, including world-class facilities in Vail, Aspen, Steamboat Springs, Winter Park, Breckinridge, Loveland Pass and many other mountain locations. Finally, with Downtown redevelopment in the 2000s and an economic boom largely due to telecommunications, Denver is an attractive environment for finding work. The city boasts franchises in all five major league sports leagues, with world class venues in and around Downtown. Originally built as a new alignment for U.S. 87, the Valley Highway initially opened in 1958 from Evans Avenue (Exit 203) north to 48th Avenue (now I-70 / Exit 213), and throughout the Denver area by 1963. An extremely busy route with traffic counts well above 200,000 vehicles per day, Interstate 25 both serves freight travel south to New Mexico and north to Wyoming, as well as commuter traffic north to Fort Collins and south to Castle Rock and Colorado Springs. The T-Rex mega project rebuilt the Valley Highway to modern standards over a six year period from Arapahoe County north to the Broadway viaduct at Washington Park West in Denver. The $1.67-billion project was completed in 2006. Additional work replaced the Broadway viaduct through Baker, rebuilt the interchanges with U.S. 85 (Santa Fe Drive) and U.S. 6 (Sixth Avenue) and added Express Lanes north from 20th Street at Highland in Denver to SH 128 (120th Avenue) at Westminster and Northglenn. RTD light rail parallels the freeway southward from Denver to Centennial and Lone Tree in Douglas County as well. Interstate 70 runs across the northern periphery of Denver, from Regis to Stapleton and Montbello. The freeway connects the city with Aurora to the east and Arvada, Wheat Ridge and Golden to the west. The oldest section of I-70 is the elevated viaduct through Elyria Swansea in Denver, having opened to traffic in 1964. The Central 70 project will reconstruct ten miles of the freeway east from Interstate 25 to Chambers Road (Exit 283). This includes lowering the highway below grade with a lid added at Elyria Swansea, and adding tolled Express Lanes. The five year rebuild starts in 2018. A belt route encircling southeast Denver through Aurora, Interstate 225 links I-25 at Hampden South with I-70 by the Gateway – Green Valley Ranch community. The freeway joins the south suburbs of Douglas County, and Denver Tech Center with Denver International Airport (DEN) via connections with Pena Boulevard north from near the north end. RTD light rail accompanies the six to eight lane freeway throughout Aurora as well. Interstate 270 winds northwest along side Sand Creek from Stapleton in northeast Denver through industrial areas of Commerce City. The urban loop provides a direct route linking I-70 and the Denver International Airport (DEN) area with U.S. 36 (Denver-Boulder Turnpike) northwest to Westminster, Broomfield and other suburbs. Prior to 2003, Interstate 270 ended at Interstate 76 from the southeast, with the connection west to I-25 and the Denver-Boulder Turnpike signed as Future I-270. The route doubles as unsigned U.S. 36, which uses I-270 to continue east along I-70 through east Aurora. E-470 provides a bypass around the east side of the Denver metropolitan area. The tollway originates in Douglas County from Exit 194 of Interstate 25, opposite C-470. The beltway encircles Aurora northeast to Adams County and Denver International Airport (DEN). Turning northwest, E-470 travels through Commerce City and north Thornton to end at Exit 228 of I-25 and the Northwest Parkway. The E-470 beltway opened in stages from June 1991 to January 2003. Full interchanges at Interstate 70 in east Aurora and Interstate 76 on the Brighton and Commerce City line are incomplete, or require at-grade connections. The bypass switched to all electronic tolling (AET) in 2009. Completed in November 2003, the 8.05 mile long Northwest Parkway represents a portion of the northwest quadrant of the Denver beltway system. Designated by CDOT as Route 470N, the toll road arcs west from Interstate 25 and E-470 across Broomfield to Via Varra and 96th Street. An at-grade portion of the parkway continues south from there to U.S. 36 (Denver-Boulder Turnpike) and Interlocken Loop. Future work will extend the road southwest as Jefferson Parkway to Colorado 93 in Golden. 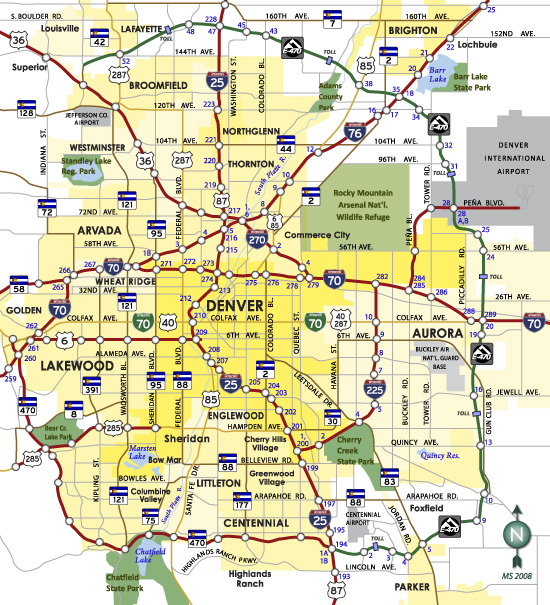 U.S. 6, the nearly transcontinental route coming into Denver via Clear Creek Canyon, crosses paths with Interstate 70 at Golden, then passes through Lakewood and west Denver as the 6th Avenue freeway. From the eastern terminus of the 6th Avenue freeway, U.S. 6 takes a convoluted route through Denver. First it turns north on Interstate 25, then heads east on Interstate 70 to Vasquez Boulevard through Elyra Swansea. The route emerges from the freeway along side U.S. 85 through Commerce City, where the pair briefly join Colorado 2 before separating at Colorado Boulevard. Colorado 2 represents the historic alignment of U.S. 6 northeast to Brighton, while U.S. 6 combines with Interstate 76 east to Fort Morgan. U.S. 36, which was extended west to overtake the Denver-Boulder Turnpike, enters the metropolitan area south from Lyons. The commuter freeway includes a tolled Express Lane in each direction as it angles southeast from Boulder through Louisville, Superior, Broomfield and Westminster. Once U.S. 36 meets Interstate 25, it becomes a hidden route, overlaying Interstate 270 southeast through Commerce City, and I-70 through northeast Denver and Aurora. The US highway branches east from the Interstate system beyond Bennett, taking an independent route across the plains of Eastern Colorado. 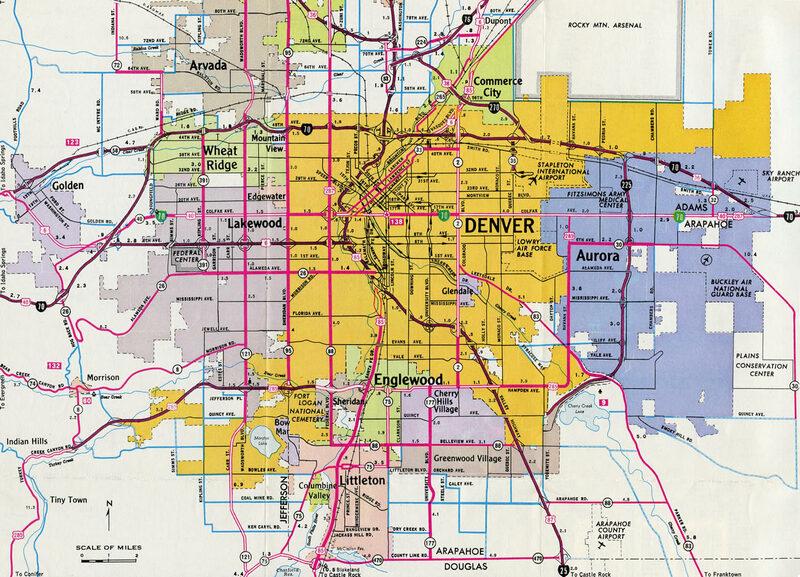 Historically U.S. 36 ran concurrent with U.S. 40 and U.S. 287 along Colfax Avenue through Aurora and Downtown Denver. U.S. 40 follows Business Loop I-70 (Colfax Avenue) east from Golden through Lakewood, Downtown Denver, and east Aurora. The two routes are consistently signed on their shared alignment, which travels along a slow moving commercial boulevard or arterial throughout most of the Denver metro area. U.S. 85 mirrors the course of Plum Creek north along Santa Fe Drive from Castle Rock and the Douglas County suburbs to Chatfield Lake and the city of Littleton. Santa Fe Drive shifts eastward and parallels the South Platte River to Englewood and Sheridan, entering the city of Denver at Overland. U.S. 85 combines with Interstate 25 at Baker, following Valley Highway north to I-70 at Globeville, and I-70 east to Vasquez Boulevard and U.S. 6 at Elyria Swansea. U.S. 6 & 85 overlap northward through Commerce City to Interstate 76. I-76 briefly carries U.S. 85 north to north Commerce City, where it separates onto Canam Highway north to Brighton and Fort Lupton. U.S. 87 remains paired with Interstate 25 along an unmarked overlap throughout the entire state of Colorado. The route joins I-25 north from Raton, New Mexico and separates with the freeway at Glenrock, Wyoming. The former business loop through Colorado Springs was not posted as U.S. 87 either. U.S. 285 meanders northeast from Park County to Morrison, where it upgrades to a freeway leading east from the Hogback to Bear Creek Lake Park and the city of Lakewood. The freeway overlays Hampden Avenue east to Bear Valley and Fort Logan in southwest Denver. Hampden Avenue transitions into a surface boulevard east from Sheridan through Englewood. U.S. 285 concludes east of Cherry Hills Village at Interstate 25 and the Hampden neighborhood. Colorado 30 begins there and continues the urban arterial east and north to Aurora as the former extension of U.S. 285 toward Colfax Avenue. U.S. 287 parallels the Interstate 25 corridor south from Longmont to Lafayette and Broomfield in the north Denver metro area. The route lines 120th Avenue east to Westminster and Federal Boulevard south to Federal Heights and Denver at Chaffee Park and Regis. U.S. 287 combines with Business Loop I-70 & U.S. 40 east along Colfax Avenue to the Denver Central Business District and through to east Aurora. U.S. 287 runs concurrent with I-70 as a hidden route through to Limon. Colorado 2 is Colorado Boulevard from U.S. 285 (Hampden Avenue) at University Heights and Wellshire in Denver north Interstate 76 & U.S. 6 along the Brighton and Commerce City line. The state highway formerly extended north to Colorado 7, near U.S. 85, in Brighton. Colorado 8 follows old U.S. 285 north from Turkey Creek Canyon to Downtown Morrison, and Bear Creek Avenue and Morrison Road east from there to Lakewood and Colorado 121 (Wadsworth Boulevard). Only a 2.97 mile section of Alameda Avenue remains as Colorado 26. The state highway runs east from Colorado 95 (Sheridan Road) and the Lakewood city line through the Westwood, Barnum and Athmar Park areas to Interstate 25 at Exit 208. Colorado 26 used to extend west across Lakewood to Rooney Valley, and upward onto Dinosaur Ridge along what is now County Road 93 north to I-70 and U.S. 40 at Exit 259. Colorado 30 is a mix of several urban and suburban roadways. The western section along Hampden Avenue, between I-25 and Havana Street at Kennedy, and along Havana Street north to Sixth Avenue in northwest Aurora, replaced the five-year extension of U.S. 285 north from I-25 in 1978. The remainder of the route serves Aurora along 6th Avenue east to I-225 and Buckley Air Force Base, and Gun Club Road south along side the E-470 toll road to Quincy Avenue (CR 30). Colorado 32 was the former designation for Tower Road from Interstate 70 at Exit 286 south to Business Loop I-70 and U.S. 40-287 (Colfax Avenue). It was decommissioned in the late 1990s. The former route of Colorado 33 took portions of Aurora Parkway, the Larimer and Lawrence Street couplet and 40th Avenue through the Union Station and Five Points areas in central Denver. All remaining signs for the route were taken down in 2002. Colorado 35 overlays a short segment of Quebec Street from Interstate 70 at Northeast Park Hill to 53rd Place at Stapleton. Until 2000, the state highway continued south of I-70 along Quebec Street to the entrance of former Stapleton International Airport at Martin Luther King Boulevard. Colorado 36 is the old U.S. 36-40-287 from Interstate 70 at Exit 292 east to Exit 316 via Watkins, Bennett, Strasburg and Byers. Colorado 44 lines 104th Avenue east from Colorado Boulevard in Thornton, 4.96 miles east to Colorado 2 in northeast Commerce City. The state highway formerly extended west from Colorado Boulevard (old Colorado 2) to U.S. 287 in Westminster. The 1.663 mile alignment of Colorado 53 parallels I-25 north from Exit 215 via 58th Avenue and Broadway to Colorado 224 at 70th Avenue in unincorporated Adams County. The Golden Freeway carries Colorado 58 east from U.S. 6 and Colorado 93 at the mouth of Clear Creek Canyon to Interstate 70 at Wheat Ridge. The route totals 5.62 miles. Colorado 72 takes a northwesterly trajectory to leave the metropolitan area, following Ward Road from Interstate 70 at Exit 266 north. Colorado 72 shifts west on 64th Avenue and north along Indiana Street before heading into the foothills via the Peak to Peak Highway. The highway reaches its northern terminus at Colorado 7 near Raymond. A two-lane suburban route, Colorado 75 follows Platte Canyon Road north from C-470 west Columbine Valley and Bowles Avenue in the city of Littleton. The state highway was truncated southward from Broadway and U.S. 285 (Hamden Avenue). Colorado 83 starts at Colorado 2 (Colorado Boulevard) and the Hilltop neighborhood of Denver and heads southeast along Leetsdale Drive. Nipping the corner of Glendale, Colorado 83 proceeds eastward through Washington Virginia Dale to Quebec Street, where it changes to Parker Road. Parked Road extends the arterial route southeast to Aurora, Foxfield, Centennial and the southeast suburbs. Colorado 83 enters Douglas County at Parker and continues south to Castle Rock and Colorado Springs. Colorado 88 takes over for U.S. 287 as the designation for Federal Boulevard south from Colfax Avenue (Business Loop I-70 & U.S. 40) and Sun Valley in Denver. The five to seven lane boulevard travels south to Sheridan, Englewood and Littleton, where Colorado 88 turns east along Belleview Avenue. Belleview Avenue straddles the Cherry Hills and Greenwood Village line east to Interstate 25 at Hampden South in Denver. An implied overlap with I-25 shifts Colorado 88 southward onto Arapahoe Road for its final stretch east across Centennial to Colorado 83 (Parker Road) at Foxfield and Aurora. Varying as a suburban or commercial arterial, Colorado 121 travels north along Wadsworth Boulevard / Parkway from the Lockheed Martin plant at Kassler north through Lakewood, Wheat Ridge, Arvada and Westminster to U.S. 287 in Broomfield. A 6.11 mile section of University Boulevard doubles as Colorado 177. The state maintained section runs north from C-470 at Highlands Ranch to U.S. 285 (Hampden Avenue) at Cherry Hills Village. Colorado 224 constitutes a 3.63 mile long minor arterial connecting U.S. 36 (Denver-Boulder Turnpike) at Broadway with U.S. 6 & 85 (Vasquez Boulevard) in Adams County. The state highway parallels Clear Creek and I-76 through industrial park areas. Angling northeast from Interstate 70 at Elyria Swanswea in Denver, Colorado 265 follows Brighton Boulevard along an industrial corridor to Commerce City and U.S. 6 & 85 (Vasquez Boulevard). Kipling Street / Parkway is a part of Colorado 391 north from U.S. 285 on the south Lakewood city line through to Wheat Ridge and Interstate 70 at Exit 267. The route totals 9.64 miles. Better known as C-470, Colorado 470 is the southwestern quarter of the Denver Beltway. The freeway connects U.S. 6 in Golden with western reaches of Lakewood, unincorporated Ken Caryl Ranch, Littleton, Centennial and Highlands Ranch in Douglas County. The freeway ends opposite the E-470 tollway at Interstate 25 in Lone Tree. Centennial Parkway was at one time planned as Interstate 470 until federal funds were revoked in the mid-1970s. Maintained by the city of Denver, Pena Boulevard is an unnumbered freeway connecting Interstate 70 with Green Valley Ranch and Denver International Airport (DEN) in northeast Denver. The limited access highway was built in conjunction with the airport. The City of Denver uses signs such as this one to signify the transition of a city street from one name to another, which is very helpful. Here, St. Paul Street ends and Steele Street begins just south of the Steele Street crossing over Interstate 25. Photo taken 11/10/03. The Steele Street bridge, which crosses Interstate 25 into the Cory- Merrill neighborhood, was replaced in 2002-2003 as part of the T-Rex project. Photo taken 11/10/03. Prior to reaching the Denver Civic Center, Police Headquarters, and Public Library, eastbound 14th Avenue approaches Cherokee Street. Photo taken 08/27/04. Fourteenth Avenue bends a bit to the south to avoid the Civic Center. Above the trees, the Colorado State Capitol comes into view. Photo taken 08/27/04. Prior to reaching the grounds of the state capitol, 14th Avenue intersects Broadway. Broadway is the old alignment of U.S. 85 south and U.S. 6 west before they were moved to the freeway system around Downtown. Photo taken 08/27/04. Two blocks east of Broadway and just south of the state capitol, 14th Avenue east reaches Sherman Street. Photo taken 08/27/04. Upon reaching Broadway, the one-way 18th Avenue westbound comes to an end. Traffic partitions onto Broadway (old U.S. 6-85) south, Trementon Street southwest and 18th Street northwest. Photo taken 08/27/04. The 16th Street Mall in Downtown Denver is closed to most vehicular traffic, although a shuttle bus travels the length of the urban street. Many shops, restaurants, and offices line the mall, which is popular with residents and visitors to Denver. Funds from the Interstate 470 project were diverted in part to construct this pedestrian friendly mall. Here is a view of 16th Street Mall near Market Street looking south. Photo taken 08/27/04. Nearing the southern end of the mall, southbound 16th Street approaches Court Place and Broadway, which is the former route of U.S. 6 west and U.S. 85 south through Downtown. The golden top of the Colorado State Capitol Building shines brightly in the afternoon sunshine. Photo taken 08/27/04. Looking north on 17th Street at Wynkoop Street and Union Station, which is the railroad station for Downtown Denver. Photo taken 08/27/04. Coors Field, home to Major League Baseball's Colorado Rockies, rises at the northeastern end of Wynkoop Street near 19th Street and Union Station. The ballpark is located at 20th Street and Blake Street. Photo taken 08/27/04. This perspective of Coors Field shows the northern end of the ballpark. It was opened for Major League play in 1995 to host the expansion Rockies, and it was expanded to seat over 50,000 fans. The 20th row of seats in the Upper Deck is painted purple to signify the mile-high elevation of 5,280 feet above sea level. Photo taken 08/27/04. View of the southern end of Coors Field, as seen from Wynkoop Street. Photo taken 08/27/04. 19th and Wynkoop Streets, one block southwest of Coors Field in Lower Downtown Denver. 19th Street extends southeast into the financial district. Photo taken 08/27/04. Page updated May 2, 2017.